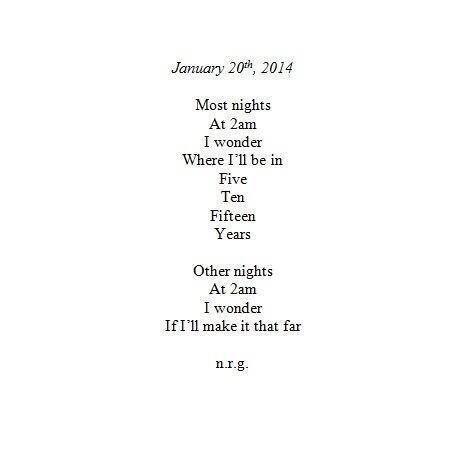 I would rather be engulfed in the 3a.m. silence than ask for help because that’s much easier than explaining why I’m not okay. Mom, my depression is a shape shifter. The next, it’s the bear. On those days I play dead until the bear leaves me alone. Sparks of a memory younger than noon. I am standing beside her open casket. It is the moment I learn every person I ever come to know will someday die. Besides Mom, I’m not afraid of the dark. Perhaps, that’s part of the problem. Anxiety holds me a hostage inside of my house, inside of my head. Anxiety is the cousin visiting from out-of-town depression felt obligated to bring to the party. Mom, I am the party. Only I am a party I don’t want to be at. Sure, I make plans. I make plans but I don’t want to go. I make plans because I know I should want to go. I know sometimes I would have wanted to go. It’s just not that fun having fun when you don’t want to have fun, Mom. You see, Mom, each night insomnia sweeps me up in his arms dips me in the kitchen in the small glow of the stove-light. 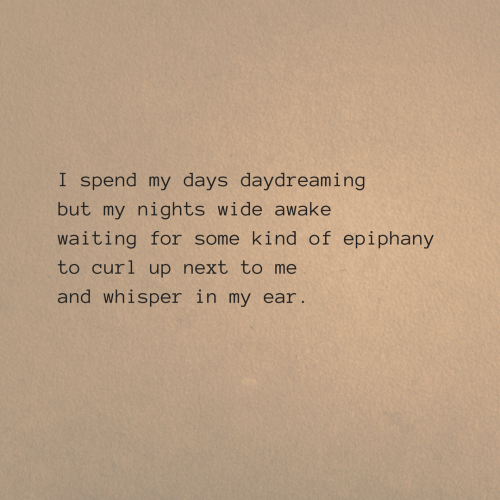 Insomnia has this romantic way of making the moon feel like perfect company. So I go for walks; but my stuttering kneecaps clank like silver spoons held in strong arms with loose wrists. They ring in my ears like clumsy church bells reminding me I am sleepwalking on an ocean of happiness I cannot baptize myself in. But my happy is as hollow as a pin pricked egg. My happy is a high fever that will break. Mom says I am so good at making something out of nothing and then flat-out asks me if I am afraid of dying. To avoid confronting the empty side of my bed. My mouth a bone yard of teeth broken from biting down on themselves. But I am a careless tourist here. I will never truly know everywhere I have been. Mom! Can’t you see that neither can I? I want all of you, every version. I want the you that dances around in only socks on the kitchen floor until you almost slip. I want the you that dances in the rain despite the people yelling at you that you’ll catch a cold. I want the you that bakes way too many cookies at one time just so you can eat extras. I want the you that sings and belts out the high notes when no one else is home. I want the you that messes with your hair until you realize you’re doing it. I want the you that only wants to be hugged and kissed and held. I want the you that hates to admit there’s a love for cheesy movies somewhere in that Netflix watchlist. I want the you that stays up late thinking of things you’d only bring up in really deep 2am conversations. I want the you that laughs uncontrollably until you’re literally on the floor even if it was just over some stupid video. I want the you that points out every dog on the street because of that overwhelming sense of pure excitement. I want the you that has to snap out of a daydream in the middle of the day. I want the you that does crazy poses for the camera even though you know you’ll just laugh later and tell me to delete them. I want the you that you are at your best. But I’ll certainly love the you that you are at your worst. Because I want all of you. Who were you before the world made you feel like you had to be anybody but yourself? Who were you before any of… this. She’s the type of girl I’d wake up at 6am for just because there is a 3 hour time difference between us. 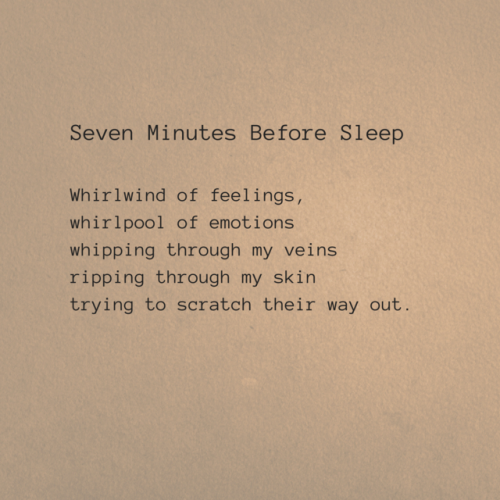 She’s also the girl I stay up till 2am writing poetry about. She’s the type of girl that doesn’t make me lose sleep because I’m wondering if our relationship is going to make it- quite the opposite actually. I lose sleep because I never have to wonder about the “what if’s”. I want her as much as she wants me and that’s always going to be a good enough reason for me. — You’re worth it, you’re always going to be. She holds on to the pain because it’s all she has left. To bed and let it sleep. All this abuse is draining. But there is no bed to sleep in. Depression steals all the blankets. I’m tired of smiling at you. I’m tired of walking on eggshells when your around. It is a heavy snorer. It’s so damn loud in my head. Bounce off the walls of my bedroom. Daddy please let me rest. 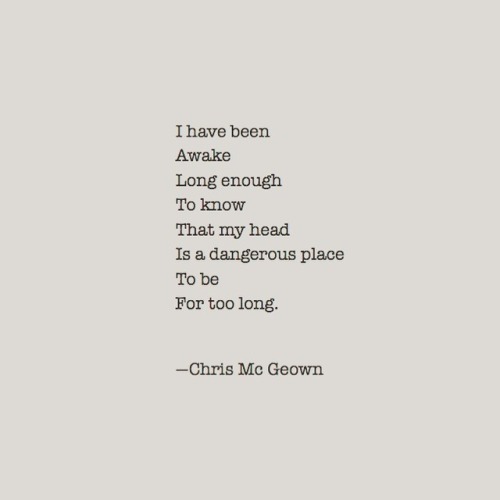 But as you said, there is no home for me here. And I can’t keeping wearing it. She is weeping from delirium. She is begging to be tucked in. Not until she is safe. -Some bedtime stories are not to be told. Your first love is going to make you believe in soulmates. Then, they’re going to make you stop believing in soulmates for a while. But hopefully someone else will come along after them and show you again that soulmates are worth believing in. When you are tired you sleep, yet I am a nocturnal bird drifting a breeze. I’m tired, my legs folded underneath me. But I have looked too long into human eyes. / Reduce me now to ashes—Night, like a black sun. Darling, if your love was a storm, I would still dance in the rain. Not every night is like tonight. Make it through this one. One will come along in which you will sleep. She kissed demons and slept with ghosts because living with the dead felt more like home.